Many happy owners of private homesthink about the expansion of their housing space, but not many have the opportunity to finish the second floor and an extra room. It is for these people the ideal option would be the attic. 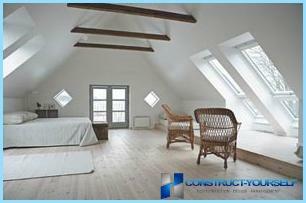 Do not discriminate against loft space, it can not look worse than any other, such as in the photo below. This type of top floor meant by ahaving two inclined walls, making it ideal for areas with high levels of precipitation in the winter, because they will not stay on the roof and did not fail her. Important! Insulating materials are laid not only at the top of the outer coating, but before laying the floor. This avoids heat loss and condensation inside the attic. the outer coating. Gable roof terrace allows you to use almost any material to cover the walls and roof. The most popular materials are: tiles, bitumen, corrugated ceiling, bricks, concrete blocks and OSB panels for the walls. Design and location of the structural elements shown in the figure below. This is the traditional version of this type of premises,but there are others. 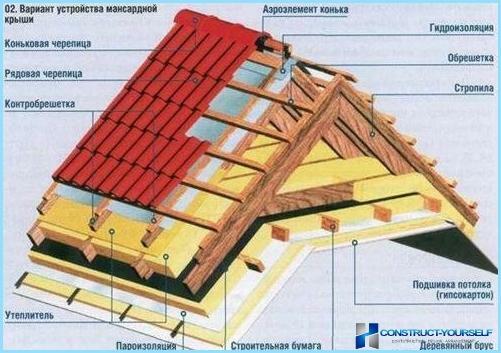 Roof gable roof, a broken line can significantly increase the usable floor space at the expense of vertical walls, but the complexity of construction and its high cost, practically exclude the option of self-built. Rafter system gable mansard roof is the simplest of all the existing ones, which allows to realize the project of the premises themselves. Important! Despite the ease of execution of this typeattic, it requires care, a sufficient amount of time and skill. Realistically assess their strength before you start work. Drafting. A very important point, because it is according to him, will be carried out all the work. When compiling is necessary to consider the future of the area of ​​the room, possible load (taking into account the level of precipitation and wind power in the region), the height of the attic floor gable roof, gable area. To create a project is best to turn to professionals who will easily be able to take into account all the features of your home and the area. Also, an important factor is the expected appearance. The calculation of the required number ofmaterials. 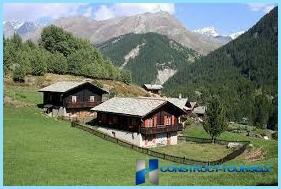 Once you have made the project, it is necessary to know how much material is needed. 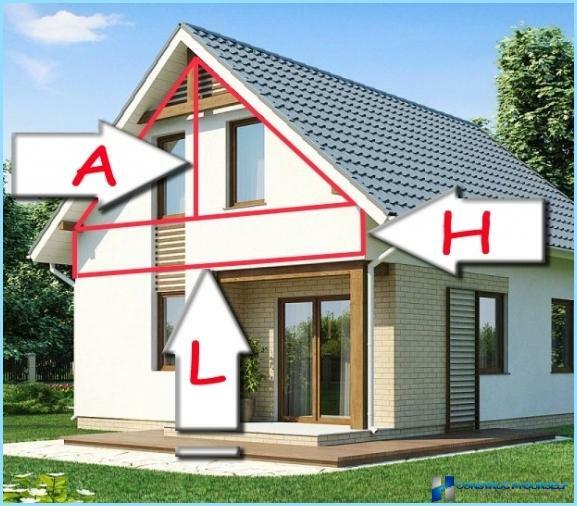 For example, how to calculate the area of ​​the pediment gable mansard roof. To do this, you need to know the following values: the width of the support walls, ceiling height at the highest point, the height of the wall under the pediment. After that, you will find an area of ​​two triangles and a rectangle and fold together. Selection of materials. Do not try to save on quality as well as the roof of your house - it is sewn from natural rainfall, and the future will be residential premises and their repair can be much more expensive than the savings. View training videos. If you have never performed such work, then you definitely need to familiarize themselves with video tutorials and a variety of instructions. Important! Try to become familiar with the most large number of videos, but choose the most suitable. Try to keep your designs have been carried out on the same principle. Installation of the insulating material and the substrate on the attic floor. Carefully read the instructions for use of the material, because it will affect the warmth of your home and the cost of its heating. Installation of supports. Driving truss system gable mansard roof is a combination of longitudinal and transverse beams and hardwood. Treat with the responsibility to step, since the slightest weakening of the structure can lead to its destruction. Replacing the bearings is virtually impossible without analysis of the whole structure. Laying insulation materials. After the truss system attic gable roof will be completed, it is necessary to build steam and waterproofing layers, so as to "dew point" was outside. Installation of the outer cover. A very important point, since this layer is the first obstacle to the weather. Do not skimp on the overlapping layers of material, to comply with any recommendations of the manufacturer. If you are going to do floor, you can not immediately detect the leakage of water, which will lead to serious complications and additional costs. Note! 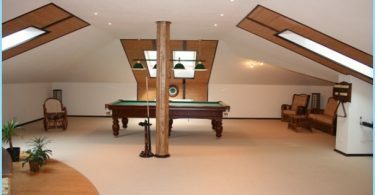 To your attic space has been properly carried out, it is necessary to seek advice from a professional builder or get information from the Internet. 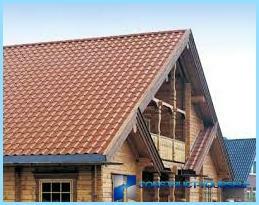 Now you know how to build a gablemansard roof by yourself, but how to make the right choice the design? Carefully review the drawings gable mansard roof before you start construction, it will allow you to avoid many problems during construction. 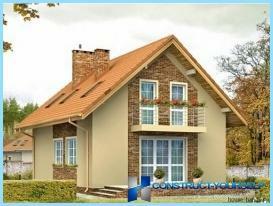 Despite its simplicity, the roof look very nice, so do not think that complex design will look more favorably. Considering all these factors, the right choice. Houses are completely different, but both looked very nice and interesting. The interior design is entirely dependent onpurpose room. Do not be afraid to use unconventional techniques and geometries. Slanted walls give a lot of opportunities to make the room not boring and original. Also keep in mind an important point that the sloping walls create an interesting effect if you lie and look at the ceiling. Beat this point. Arrange a variety of decorative elements. It is also possible to use a large central lamp, because the ceiling height is sufficient for him. Do not be afraid to experiment, be original, and you'll soon notice that, despite their maybe a small area, the room will be the most any location in your home. Also in the attic it is possible to organize the conservatory or library. Distance and good insulation of the room, making it ideal for relaxing.